Sean began playing acoustic guitar at age ten. It took five years before he got his first electric guitar—a used Morris Strat copy. The Strat became the object of Sean’s amateur luthiery! Jethro Tull, Eric Clapton, and Santana were his early inspirations. He spent time learning their licks and riffs. The high school years saw Sean build his own distortion pedal from an Ibanez schematic he scrounges from the local music store. After playing in high school bands Sean performed in both duo and four-piece top-forty bands while studying electrical engineering at the University of Cape Town. All this during the early 1980s. Given his less than enthusiastic appreciation for the standard rock vocal outfit, Sean was not entirely displeased when a fledgling attempt at vocal oriented rock failed due to his well… exacting requirements. He was free to focus on his real passion: composing original instrumentals. Around this time there was another turning point in Sean’s focus: He heard Yngwie Malmsteen play. Malmsteen changed guitar playing as we know it. From now on Sean would not be happy with a lesser standard. Work as a recording engineer during the early 1990s enabled Sean to record the original neoclassical instrumental compositions, Electric Storm, now available on the CD. Sean accomplished this between engineering recording sessions and teaching a training course on operating a MIDI studio. Sean has engineered commercial recording sessions and has occasionally worked as a session guitarist. He also maintained a full roster of private guitar students for several years, and performed clinics at his alma mater (the University of Cape Town), as well as at several events organized by local music stores. In 1993 Sean and bassist Johan Buys gave a clinic on the heels of a workshop by jazz guitarist Frank Gambale—not an easy act to follow! Sean’s demo showcases his skills as a producer, engineer, writer, performer, and keyboardist. His set of neo-classical instrumentals are [sic] reminiscent at times of works by Tony MacAlpine. Complex arrangements, tightly played ensemble lines, and a grand display of thematic solo work should make this tape of particular interest to neo-classical fusion fans. 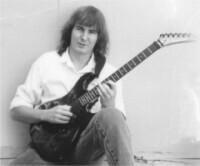 (Mike Varney, Guitar Player, October 1991). Sean holds a Ph.D. in electrical engineering. Originally from Cape Town, he now lives in the US with wife, writer Ilana Mercer and parrot Oscar-Wood. When he’s not at his day job, Sean is hard at work on his next instrumental CD, and is putting the finishing touches to his forthcoming guitar tuition book. He has also served as a judge at the Guitarmageddon contests organized by Guitar Center.